The company behind the book studied hundreds of thousands of people and was able to determine 34 common talents. The book only has a short introductory chapter and the rest is a directory of the 34 talents that they synthesized. Its basic premise is that sometimes we keep ourselves too focused on improving our weaknesses, when we should be focusing on playing to our strengths. I briefly discussed this in an earlier post (The Power of Quitting). The book explains that the time it takes to improve our weaknesses may have been spent instead on playing to our strengths, which could yield double or even ten fold results. This premise was the introductory chapter. What a powerful introductory chapter! What excites me more is the next part of the book. So we take the test online and they give us our results. But they don’t just stop there. They also give us tools and suggestions on how to play to them. They create a personalized guide, and an action plan! Talk about value for the reader. So why am I so excited? Through this test and the guides and action plans for each person, they are able to communicate more personally to us, their market. Even though it’s done online and through an automated process, we still feel special because we feel that they made something just for us. To be honest, I don’t think the introductory chapter was worth the cost (it cost around Php 899). Reading the directory of talents is useless if you don’t know which are yours. But put together the different parts and you get a much, much bigger whole. Gestalt at work. I see this book instead, not as a book, but as a psych test, which can easily cost more than Php 899! Is this good for the company? It’s like they’re giving a test away for a cheap price. Actually the way I see it, this book benefits them in a HUGE way. For each person who takes their test, their database builds up, they get more data, which can help them improve on their research! They share their research, make it personal for the consumer, earn from the test and build up their database for future research. When they publish their next book with better findings, this cycle repeats, because people will want to know about the new discoveries. I don’t know about you, but I think this is one of the most sustainable and innovative business models I’ve come across. I’m not endorsing them, but I think this is another book that is worth the cost. I’d lend you mine, but it’s not the same. I’m not sure if you know about this or not, but there are a few other points. There is a Forums section on the Gallup site which can be useful for sharing with others that have done the questionaire and seen what results they have. 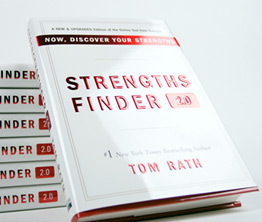 “Strengths-Based Leadership” is another book that takes a look at the 34 strengths from the perspective of leadership and how to lead using each of the strengths under various other themes like trust, compassion, stability and hope. It is also quite a useful exercise to my mind. My top 5 strengths are Learner, Achiever, Responsbility, Intellection and Strategic, just to share that so I do have a couple in common with you. Actually I haven’t seen that section yet! I have just been reading through my results. But now that you mention it, that’s a great way to get the people involved. Not to mention the insights that they may find in the Forums! I’ve seen that other book, and it looks interesting, too. I’ll be sure to get that book. Right now I’m just trying to see how I can apply the recent learnings to myself. Cool, it looks like you’re a very, very analytical person. Thanks for sharing that!